Excited to read it? Please add your vote! He will do anything to protect her . . . even if it means breaking her heart. 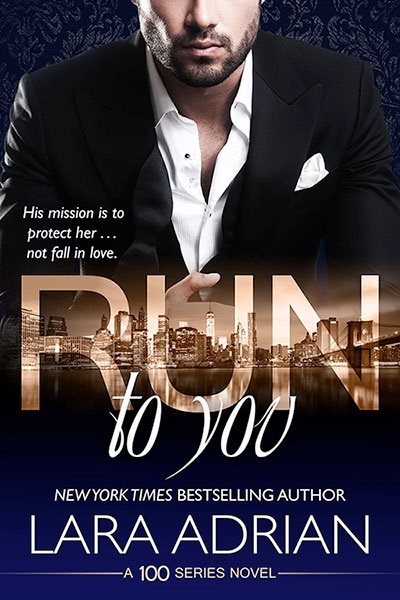 Lara Adrian's sizzling, suspenseful 100 Series continues with RUN TO YOU, a scorching new standalone contemporary bodyguard romance featuring friends of billionaire Dominic Baine and his artist fiancee Avery Ross. Once a celebrated model, Evelyn Beckham dominated the fashion runways of New York, Paris, and Milan. But life under the lights nearly destroyed her, and at the height of her career she walked away from it all. Now, five years later, Eve's built a new life at the helm of Manhattan's premier high-end lingerie boutique, L'opale. Chosen to design the bridal ensemble for billionaire Dominic Baine's fiancée, Avery Ross, it seems Eve's stars have finally realigned-until her return to the spotlight thrusts her into the crosshairs of a danger that's been watching from the shadows, waiting for the chance to strike. Gabriel Noble didn't go to war to become a hero, but when he returned from the battlefield in Afghanistan it was with a chest full of medals and a broken body filled with shrapnel. Losing his leg derailed more than Gabe's career, and when no one else was willing to take a chance on him, Baine International put him on their security team. Now, Gabe would do anything for Dominic Baine-including keeping a covert, protective eye on beautiful Evelyn Beckham as a personal favor to his boss and friend. But keeping Eve safe means keeping her close, and soon the lines between duty and desire begin to blur into a consuming passion too powerful to be denied. With Eve's life in escalating peril and her faith in him certain to shatter, Gabe will have to risk everything to protect her while facing the most intense fight of his life . . . the battle for Eve's heart. RUN TO YOU is a sizzling, suspenseful new standalone contemporary romance set in Lara Adrian's bestselling 100 Series story world.